The Britannia has always offered beauty and reliability. Now it also gives you 0.9999 fine gold purity.The legendary figure of Britannia, which first appeared on Roman coins in the second century AD has come to symbolise Britain’s strength and integrity. 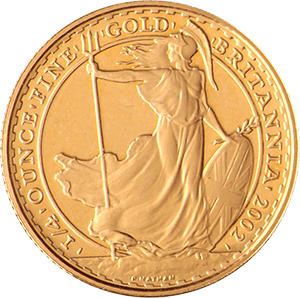 The 1/4 Gold Britannia is one of the original standard weights for the gold bullion coin that were released in 1987 (along with the 1oz, 1/2oz and 1/10oz editions). In 2013, three other weights were added to the yearly mintage of the coin (5oz, 1oz slim design and 1/20oz). Also in 2013, the Royal Mint increased the purity of all Gold Britannia coins from 22 carats to 24 carats. In percentage terms, this meant that the pure gold content improved from 91.7% to 99.9%. As a result, like all fine gold products of this level of purity, the Britannia needs to handled and stored with care in order to ensure the coin maintains its value as it can be mailable. 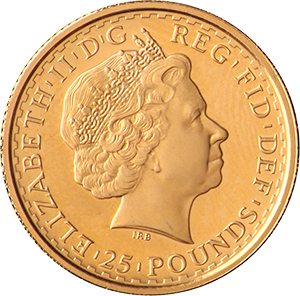 The 1/4 Gold Britannia, whether the 1987-2012 versions or those of the newer mintage, has a diameter of 22mm. The gold content now weighs 7.86g (increased from 7.776g). It has a milled edge and the coin has remained largely the same since its introduction in 1987. The coin’s inverse shows the ancient figure of Britannia, the female personification of the British Isles that dates back to ancient times and was finally depicted by the Romans in a way that we would recognise today. Designed by Philip Nathan, it has remained wholly unchanged since the first mint in 1987. On the coin’s obverse is the figurehead of Queen Elizabeth II. The portrait has changed twice over the decades of the coin’s existence, most recently in 2015 by Jody Clarke, in order to capture the Queen during the different phases of her reign. With a face value of £25, the coin’s gold content alone makes it worth many times more than this. As ever with precious metal products, this will depend on the market and the coin’s condition.